LOCKHART, TEXAS—The pilot of a hot-air balloon that crashed in Texas, killing all 16 people aboard, was convicted of drunken driving at least four times in Missouri and twice spent time in prison, court records show. A former girlfriend described Alfred “Skip” Nichols as a recovering alcoholic. She said the 49-year-old had been sober for at least four years and never piloted a balloon after drinking. Among the 16 people who were killed in the hot-air balloon crash over the weekend were a couple celebrating their 17th wedding anniversary, a researcher whose work focused on treating burn victims and a woman who took her mother as a belated Mother’s Day gift, grieving family members said. Authorities have not publicly named anyone killed in Saturday’s crash, saying it could take a while to identify the bodies. But Nichols was identified as the pilot by his friend and roommate Alan Lirette, who said that Nichols was a good pilot. Some family members have come forward to say their loved ones were aboard and to speak of the growing dread they felt in the hours after the crash as their frantic texts and voicemails went unanswered. Josh Rowan said his brother and sister-in-law, Matt and Sunday Rowan, were among those killed. The couple, both 34, grew up in College Station and had been friends since high school, and had just gotten married in February, he said. “All of us were sort of calling them and texting them and messaging them and just trying to get anything back and just sort of time went on and we didn’t hear anything back,” Rowan said, noting that authorities later told the family his brother and sister-in-law were aboard the balloon. Joe and Tresa Owens took the balloon ride as a belated anniversary present to themselves, his sister, Angie Nadolny of Mattoon, Illinois, said by phone Monday. 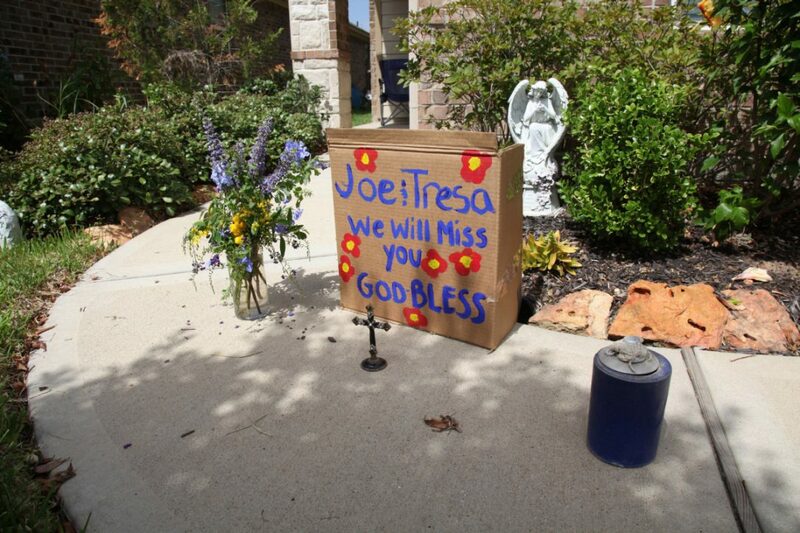 The couple had been married 17 years and lived in Brookshire, west of Houston. Nadolny said her brother posted a photo on social media saying he and his wife were about to go on a balloon ride and giving the same launch location as the one used for the ride that crashed. She said she and other family members kept trying to call her brother, but they never heard back. She also said she’s grown frustrated that authorities haven’t revealed the identities of the victims in the crash, which is being investigated. “No one at all, as far as any authorities, can tell me what happened to my brother,” she said. Paige Brabson organized the balloon ride as a belated Mother’s Day gift to her mother Lorilee Brabson, according to Jason Pino, the brother of Lorilee Brabson. Pino told KKTV in Colorado Springs, Colorado, that his sister was posting photos to social media for much of the ride and then the postings stopped. After news of the wreck broke, family members started calling the two to check on their safety. “We were just praying they were out of service or something,” Pino said. Authorities say the balloon, which was operated by Heart of Texas Hot Air Balloon Rides, hit high-tension power lines before crashing into a pasture Saturday near Lockhart, about 60 miles (96 kilometres) northeast of San Antonio. The St. Louis Post-Dispatch reported in 2008 that the Better Business Bureau had warned consumers about doing business with Nichols. It was the third time since 2000 that he received an unsatisfactory rating for not responding to complaints. The paper quoted the BBB as saying Nichols was on probation in Missouri for the distribution, delivery or manufacture of a controlled substance. When asked to respond, Nichols declined to comment. Bartch, who said she met Nichols in St. Louis in 1989, said Nichols’ alcoholism and criminal record caused tensions with his father, Alfred G. Nichols III, a decorated retired lieutenant colonel who piloted medical evacuation helicopters in the Vietnam War. According to a February 2016 online obituary, the elder Nichols was awarded a Purple Heart among other medals and had commanded a helicopter rescue unit at Fort Carson in Colorado. Bartch said “there had been a mending” in Nichols’ relationship with his father in recent years. Bartch described Nichols as lighthearted, a follower of the Grateful Dead whose dogs, Zappa and Joplin, were named after two of his favourite musicians. Federal Aviation Administration records indicate that the Texas company was involved in an accident with same balloon two years ago. On Aug. 3, 2014, the balloon made a hard landing in Kyle, Texas, when the pilot touched down abruptly to avoid striking a ground-crew vehicle that had been parked in the balloon’s path. Two passengers were hurt. At the site of Saturday’s crash, NTSB investigators recovered 14 personal electronic devices, including cellphones, an iPad and three cameras. They will be sent to a lab in Washington for analysis. which cannot be trusted all the time. and their oaths of office mean nothing unless there is accountability. This particular pilot was not accountable. His licence was not pulled as it should have been. If he had been a regular fixed wing airline pilot, he would never had got a job. the Judiciary and the Ottawa Police. of their contempt for the law that they swear a meaningless oath to uphold. and their partners in crime, the Children's Aid Society of Ottawa.